Today’s cookie is based on a type of Tuscan cookie I discovered several years ago while visiting Florence. Fishermen’s Bread aka Pane del Pescatore are round cookies with hard shells and soft crumbly interiors filled with dried fruit and nuts. Pane del Pescatore are about the same size as typical scones or biscuits, but their texture is different. While the outside shell is dry and has some crunch to it, the insides are crumbly and soft and loaded with dried fruit and nuts. They tend dry out a bit as the day goes on, but their taste only improves. Of course that is completely subjective! I just think they taste better after they’ve been sitting around for a day or so, and I haven’t decided yet whether I like them as-is or with a more dried out inside. 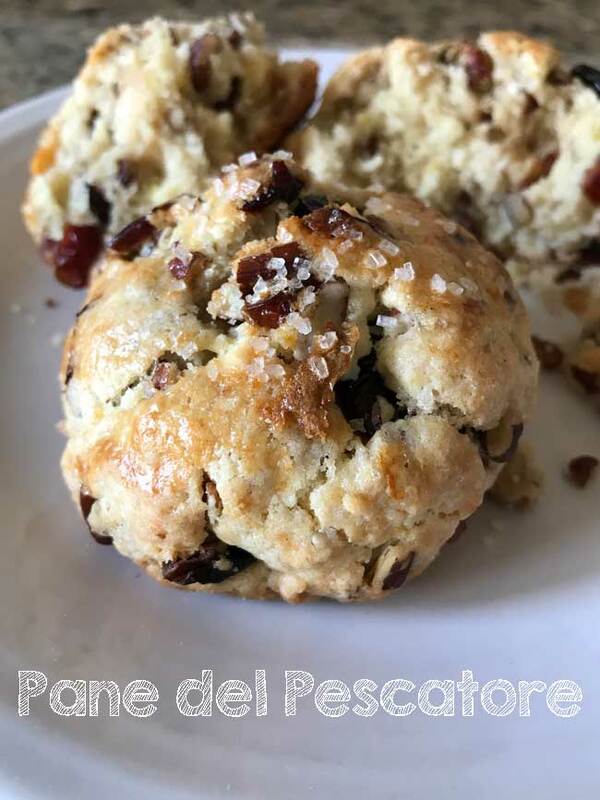 There are dozens of ways to make Pane del Pescatore, but I don’t make them as often as I should because I tend to forget about them. Lately I’ve been in the mood for slightly less sweet treats, and these Italian cookies hit the spot — so much so that I started experimenting with different flavors and different flours. Here in Chicago it’s pretty easy to find type 00, a finely milled Italian flour made with soft winter wheat, but bread flour also works well. I’ve also used varying gram amounts to get different results. More egg gives you a more cakey inside, while less egg makes the cookies slightly dryer. 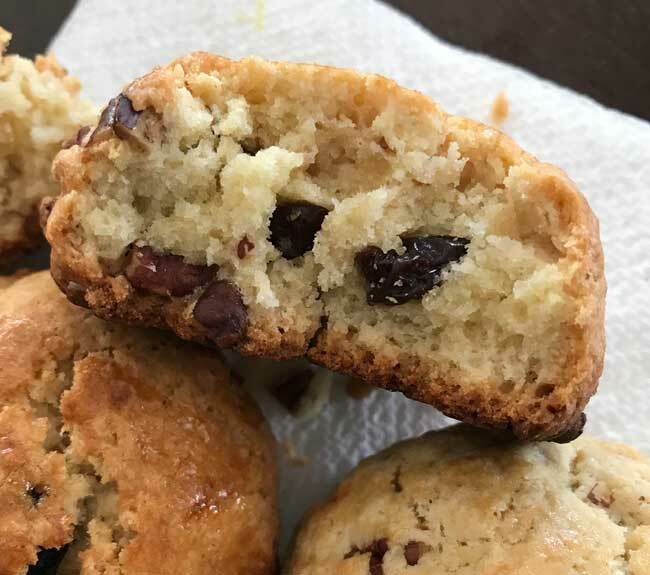 And if you like your insides even dryer, you can bake the cookies even longer and a low heat and dry them out As for flavors, golden raisins and almonds work well, but so does a combo of dried cranberries, white chips and pecans. The recipe is open to improvisation, which is why I’m keeping it small. Each batch comes together in about 2 seconds, so you can whip up one flavor combo, shape it into balls, then make a second. Fishermen's Bread aka Pane del Pescatore aka Italian Scones are large cookies with hard shells and soft interiors. These are best made with nuts and fruit. If you don't like nuts and dried fruit, this might not be the cookie for you. In the bowl of a stand mixer fitted with a paddle, mix together the flour, salt, baking powder, sugar and zest. Make sure all the dry ingredients are very thoroughly blended, then add the butter, egg and vanilla. With the paddle on low, stir everything together, until blended stopping to scrape the sides of the bowl. Stir in the nuts and dried fruit and then use your hands to gently knead into a cohesive dough. Shape mixture into 5 balls and arrange 3 inches apart on the parchment lined baking sheet. Brush with extra beaten egg and sprinkle with more almonds if desired. Bake in a preheated 375 degree oven for 25 minutes. 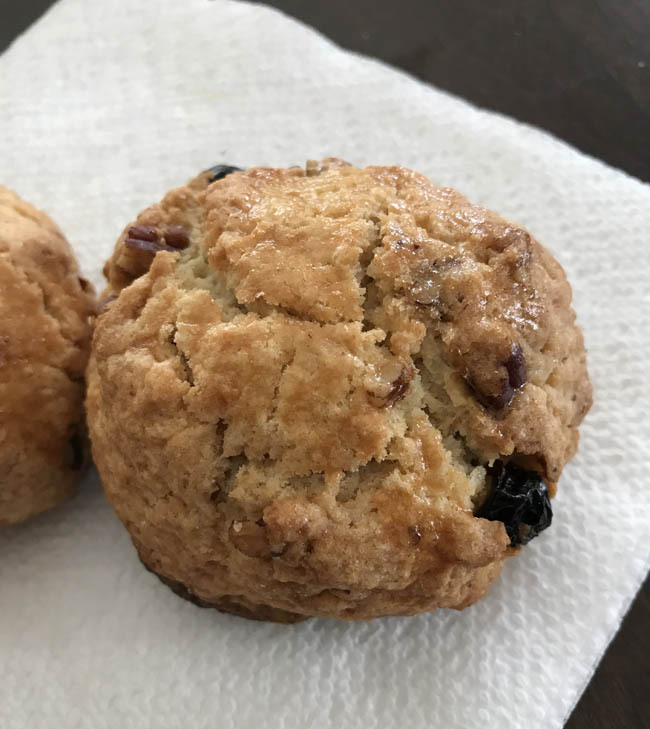 This still give you dark edges and a soft and crumbly interior.If you’d like a crunchier cookie, bake for 20 minutes at 375, then reduce heat to 250 and bake for another 20 minutes. Let cool completely. Lisa, thanks for testing with the ginger. I didn’t have any around, but I kept thinking the cranberry white chocolate version would be really good with ginger. Glad to hear it worked well with pistachios. I made these with pistachios and crystallized ginger and they were great! Perfect not-too-sweet afternoon snack. Thanks for trying them, Angela! Also, I’m glad you like the small batch recipes. These came out terrific! I’m also grateful that the recipe makes just a few cookies!!! Thanks for always providing us with such interesting recipes! These sound really interesting. They almost sound like something you could eat for breakfast. The cranberry white chocolate version sounds especially appealing or maybe cranberry orange, or cherry almond. Yes, definitely. By the way, I just tried the cranberry, almond, white chip version and am now thinking it would be great with a little crystallized ginger. Cool! These sound delicious! It is nice living in a place where you have so many ingredients (same where I live), and now with Amazon!